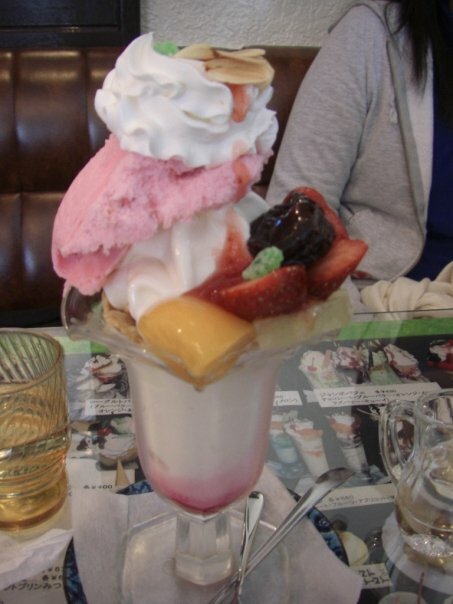 If there is a dessert that Japan excels at, it would be the parfait. None of this single topping nonsense, instead the parfait is a work of art and balance. Case in point, this Fruit and Yogurt parfait. Fresh strawberries, pineapple and bananas carefully balanced on a scoop of vanilla frozen yogurt, atop layers of soft serve and crunchy granola with dried fruit. All topped off with a swirl of whipped cream, strawberry sauce, a sprig of mint and a cookie pirouette. Strawberry and Mango Ice Monster: Very finely shaved ice, layered with milk and sugar syrup, and then topped wit strawberries, mangoes and condensed milk. A very chic version of ais kacang or pat bing su. My new favorite way to use fresh fruit in season. Sweet but still very light and refreshing. I didn’t have a proper tart tin, so I used a 15cm pie dish. 1.Sift together flour and brown sugar into a medium bowl. Cut butter into small cubes and use a fork or potato masher to combine into flour and sugar until the butter is in small crumbs. 2. Beat 1 egg and add to flour, butter, sugar mixture. Mix. 3. The mixture should be a little moist. You should be able to press the crumbs together to make a dough. If it starts to feel very greasy, refrigerate until it is firm again. 4. Roll out dough to about a centimeter thick, and press into pie pan. Line the top of the tart shell with aluminum foil and place dried beans or a heavy bake dish around the same size as the interior of the pie dish in the center to weigh down the shell. Preheat oven to 210 degrees Celsius. Bake for 10-14 minutes until golden brown. Remove foil and beans/bake ware. 5. Thoroughly chill tart shell in the refrigerator. 1. Using a fork, mix the softened cream cheese, lemon juice, confectioner’s sugar and vanilla together in a medium bowl. 2. Use a hand mixer to combine the cream cheese mixture and gradually add in heavy cream. 3. Mix until the filling is soft and smooth. 4. Using a spatula, fill the chilled tart shell and set aside. 1. Gently toss strawberries in lemon juice and granulated sugar. 2. Arrange kiwi slices and strawberries however you like on the top of the tart. 3. Chill in the refrigerator for 10-15 minutes. This month’s お楽しみ給食, fun school lunch ! Corn Cream Soup: A cream stew with sweet corn, onions and bacon. Potato and cucumber salad: mashed potatoes, sliced cucumbers with mayonnaise. Ebi Fry: shrimp rolled in panko, and deep fried. Strawberry Young: Be still my rumbling stomach! Strawberry Young (苺ヤング): Layers of vanilla soft serve, strawberry ice cream, cornflakes, fruit and whipped cream. The sheer amount of ice cream sent me into a dairy coma.